Non-medicinal ingredients: microcrystalline cellulose, sodium stearyl fumarate, rice syrup. Capsule: hypromellose. Quercetin is a dietary flavonoid found in apples, onions, tea, and berries and has a variety of health benefits. Pro Quercetin is effective in the management of hypersensitivity reactions, particularly type I IgE mediated reactions that cause a histamine release, like seasonal allergies. It alleviates allergies by stabilizing the membranes of certain immune cells to prevent them from releasing histamines. It also blocks enzymes that are responsible for producing inflammatory molecules that sensitize the body's pain receptors. In addition to immune modulation, Pro Quercetin is also effective in regulating inflammation and acts as one of the most powerful antioxidants. 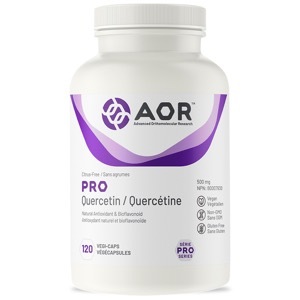 AOR's Pro Quercetin is derived from citrus-free sources to avoid sensitivity reactions and is pharmaceutical grade to take advantage of the health benefits offered by this flavonoid powerhouse. Adult Dosage: Take 1 capsule twice daily with food. Cautions: Reassess for use beyond 12 weeks.